When you are going to create more than one barcode at a time, or multiple barcodes of the same kind with similar values, you will love the Sequence Editor. You open it by choosing either the first entry of the barcodes types menu, Create With Sequence Editor , or the Sequence Editor icon in the toolbar. 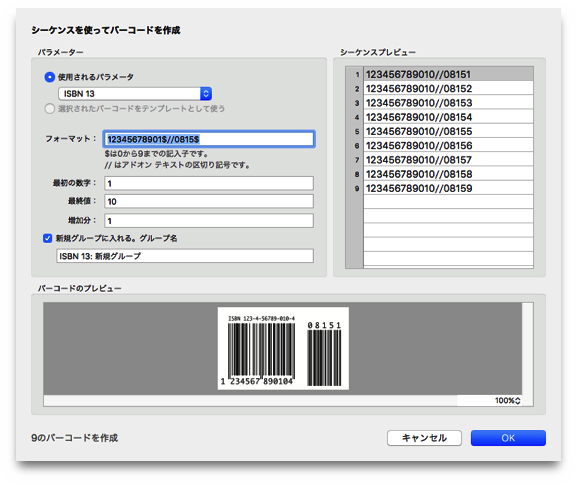 ヒント: The barcode types menu is accessible from the bottom of the barcode list area, either via the Plus button, or from the Action button drop-down menu item 新規バーコード . The Sequence Editor is a sheet which drops out of your barcodes document window. It is really powerful, and saves you much time when creating multiple barcodes at once. The parameters are described in detail as follows. ... use the previously selected barcode from your barcodes list as the type template for your new barcodes sequence. 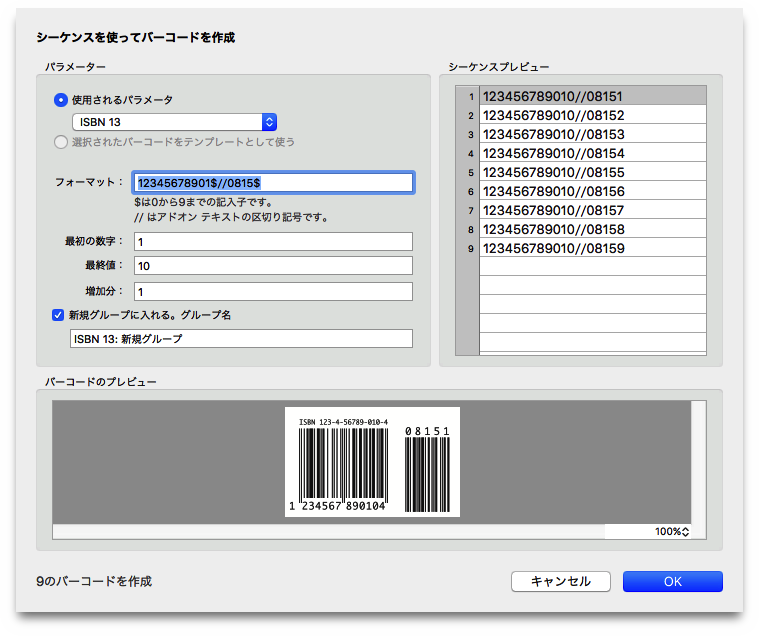 ヒント: If you haven't already selected an existing barcode, then this option isn't available. This parameter is rather important so we put it first: All characters entered here will be part of the Barcode data, so you can set up even an exotic barcode data string very fast. You need to know that the placeholder $ stands for any digit from 0..9. For example, if you want to create a sequence of GTIN-13 barcodes which should all start with 49624 , just type it into the Format line, followed by 7–8 $ characters (GTIN-13 has 12 digits + one checksum digit). If you want to generate Add-on content for your auto-generated barcodes, too, use the // separator string behind the barcode data string. Then you can add more cyphers and $ placeholders for the Add-on content. Here you define the start value of the variable digits in your barcodes sequence. Here you define the end value of the variable digits in your barcode sequence. If you are not quite sure about the end value, simply enter as many 9's as there are variable digits in your barcodes sequence. We're talking about a barcode sequence here, right? You may want to increase the barcode data by 1, or by 10, or by 42, or whatever you need. Enter the increment value right here. The preview will immediately show the results, so you can fix any of the previously entered values to get the desired barcode data pretty fast.